On Tuesday, Apple released the macOS High Sierra 10.13.6 Supplemental Update that is supposed to fix the CPU throttling issues that have plagued the 2018 MacBook Pro since its release. We installed the update on a 15-inch 2.9GHz Core i9 MacBook Pro, and ran several benchmark tests to see if, as Apple promised, performance improved. Our preliminary results show that yes, the update does boost the laptop’s speed. 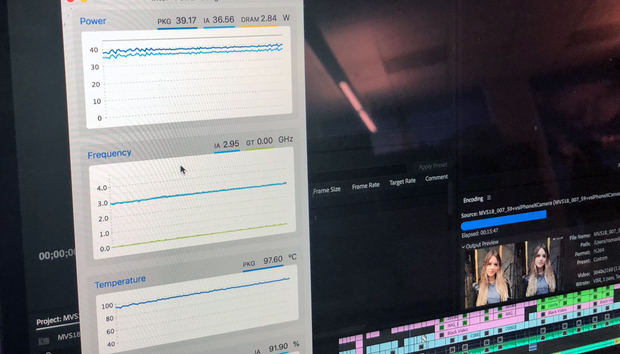 For example, in our Adobe Premiere test, the updated 2018 MacBook Pro was about 11 percent faster than the same laptop without the update. Compared to the 2017 15-inch 2.9GHz MacBook Pro, the updated 2018 laptop was 22 percent faster. The Intel Power Gadget was used to monitor the CPU speed and temperature. Before the update, the new MacBook Pro showed a lot of variance, often dipping below the base clock speed. With the update, the laptop performed much more consistently, and was able to maintain base clock speed in most tests. We also saw improvements in the Cinebench CPU, Blender BMW CPU, and VRay benchmarks. We are running more numbers, and will have an update with finalized numbers later this week. These results are preliminary and are subject to change based on further analysis.